Explanation: As the New Moon continues this season's celestial shadow play, an annular solar eclipse track begins in western Australia at 22:30 UT on May 9 -- near sunrise on May 10 local time. Because the eclipse occurs within a few days of lunar apogee, the Moon's silhouette does not quite cover the Sun during mid-eclipse, momentarily creating a spectacular ring of fire. While a larger region witnesses a partial eclipse, the annular mid-eclipse phase is visible along a shadow track only about 200 kilometers wide but 13,000 kilometers long, extending across the central Pacific. For given locations along it, the ring of fire lasts from 4 to 6 minutes. Near the horizon, the appearance of the May 9/10 annular eclipse (online viewing) is suggested by this dramatic composite from May of 2012. 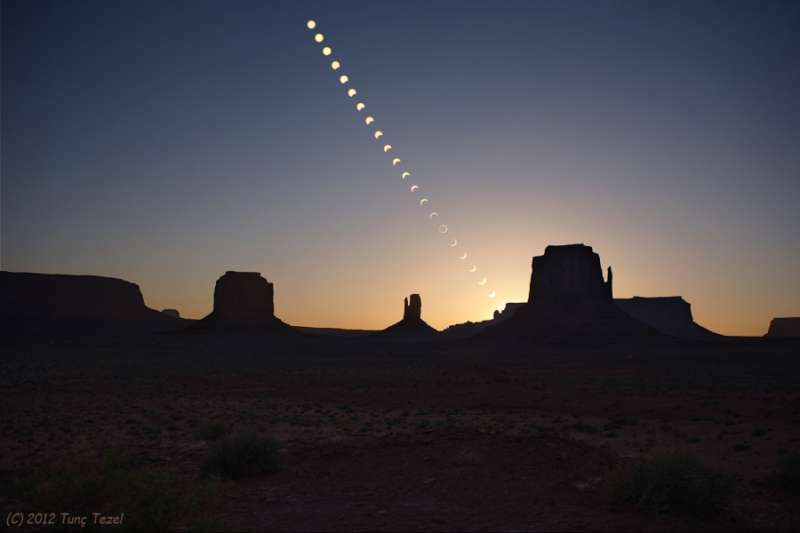 The timelapse sequence depicts an annular eclipse in progress before sunset over Monument Valley in the southwestern United States.